I hadn't heard Machinae Supremacy before, but it is definitely one of the weirder power metal acts I've heard. There have been bands influenced by old computer music before, but Machinae Supremacy goes further than that: It is old computer music, at least in all the ways that count, incorporating a genuine Commodore 64 synthesizer chip into their sound. I can understand it, though; as I've mentioned in a previous review, some of those old game and demo tracks sounded pretty good. 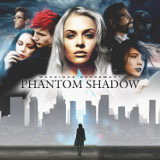 And so does their latest album, Phantom Shadow. The Villain of This Story summarizes the band's sound. The rhythm guitar is mechanized and chugging, with a high, shrill lead guitar, usually harmonized, overlaying everything. There's a hard, clean quality to the production like a really talented amateur has mixed it on a computer sampler -- which I'm pretty sure was exactly the effect intended. Their vocalist and rhythm guitarist, Gaz, takes a few minutes to get used to; he has an emotional tone and an enthusiastic delivery, but a limited range and a rather unfortunate bit of whininess to his voice. The tight integration of the synth and the rest of the instruments, though, is what makes this and some of the other tracks great -- Perfect Dark has a lovely melody, and the synth really soars on this track. Which brings me to the synthesizer, the real star of the show. Though the guitars are excellent on the album, the synth, driven by the wondrous 1980s-era SID chip that one can barely find anymore, is superb -- and the band knows it, which is why it pervades all the songs. Most power metal bands are dominated by guitar, even if the keyboard is going full tilt next to it -- I can't imagine Sonata Arctica, for example, holding up its sound purely with synth --, while many bands fake traditional instruments with synths all the time, but try to attenuate its use somewhat. Here, though, the synthesizer use is completely unashamed, and the retro electronic sound is as artificial and delightful as a Jolly Rancher candy. Not that it is never upstaged; in Europa, though it provides special effects, the attention is on the acoustic work, filled with metal strings clashing together and harmonized leads, while Phantom Battle's guitar riffing is excellent but with the synthesizer keeping a low profile. I won't get too far into the lyrics; the album is a concept album, and the lyrics are fairly good at describing the story without being too overt. There are plenty of clever references to gaming and game titles, most of which I recognize but don't "get" (I haven't played video games for years), and the first tracks are no flukes; tracks such as Throne of Games, which has a major-key tune and emphasizes the guitars, and Versus, which has a good synth track despite the forgettable melody, prove this. But Phantom Shadow is still sometimes pretty barren. Too many of the songs have a similar melody and don't change much, leaning instead on that kickass synthesizer to pull the listener through yet another mid-range song in time for another quick instrumental break. Beyond Good And Evil is the longest, but simultaneously the most boring, track on the album, and The Bigger They Are the Harder They Fall sounds like a warez distribution group's demo with a forgettable power metal song tacked on the end to drive the story a little further; for all the good it did the listener, they could have just made it an instrumental. These weak points are covered over by some better tracks too, though; The Second One's snappy beat is fun to listen to with a heavy song to accompany it, while the final track, Hubnester Rising also puts significant effort into an epic sound and subordinates the synth to the overall melody, something that I felt, after listening to the whole album, was probably a pretty good idea. Despite some tracks that weren't all that great, overall this is quite enjoyable to listen to. Even if one is not the sort who listens to video game music for pleasure, Machinae Supremacy has put together a strong effort that deserves a listen by any power metal fan.